These days we end up having a lot of over ripe bananas. I think its the warm temperature. So I have been freezing sliced bananas to prepare smoothies and milkshakes and have also been baking with it. I tried a couple of recipes including the chocolate banana cake and a banana muffin recipe. 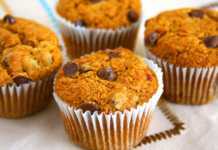 I have posted a recipe for chocolate chip banana muffins earlier and received feedback from some of the visitors that it didn’t turn out as good as expected. Actually it came out well and tasted pretty good. Since some of them didn’t get it right I decided to try another recipe and here it is. 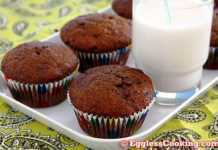 I found this recipe for banana chocolate chip muffins in the Taste of Home baking book. I have used bananas itself as an egg substitute and have increased the quantity of baking powder. These muffins came out as good as the previous recipe. It raised perfectly and tasted very good too. I would say that its pretty much low in fat too with just 1/3rd cup of canola oil. Everybody in our house liked it and so did my neighbor’s family too. 15 Mins 20 Mins 12 regular size muffins. Don’t throw away those over ripe bananas sitting on the counter. 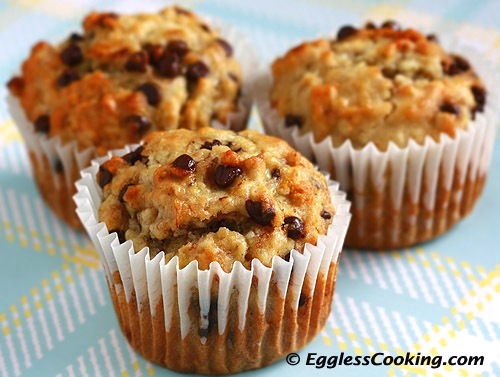 Bake these very simple yet delicious chocolate chip banana muffins and I promise that you will stop eating bananas to let them ripe to make these muffins over and over again. Preheat oven to 375F/190C for 15 mins. Lightly grease and line the muffin tin with paper liners. I pureed the bananas using a hand blender with a tablespoon of water in a large mixing bowl. You could simply mash them with a fork or potato masher too. To the banana mixture add the sugar and oil; beat it well with a whisk or electric beater. To the wet ingredients add the flour, oats, baking soda, baking powder and salt; mix until just combined. Stir in the chocolate chips. Fill each muffin cup 3/4ths full; around 3 tablespoons per cup. Bake for 18-20 minutes or until a toothpick comes out clean. Cool for 5 minutes before removing from pan to wire rack. Do not leave it in the tin for more than 5 minutes because the paper liner will start giving out moisture and the muffins will become soggy. If you want to eat the muffins while it is still warm I would suggest spraying the paper liners with non stick spray, so that you can peel off the muffins easily or wait until its cooled completely to remove the paper. 3/4th cup of mini chocolate chips looks like a LOT while adding to the batter but the muffins did taste very good. 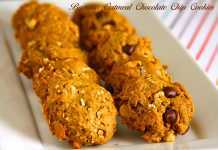 So if you are health conscious you could substitute chopped nuts for some of the chocolate chips. It turned out yum.. i added dates..
Looks like a great recipe! Can I use butter or ghee instead of canola oil?